IAM Local 264 Bus Mechanics who keep thousands of Boston’s “T Buses” in working order are protesting a proposal from Massachusetts Republican Gov. Charlie Baker to privatize the work. The move would force cuts to pay and benefits, say union members. 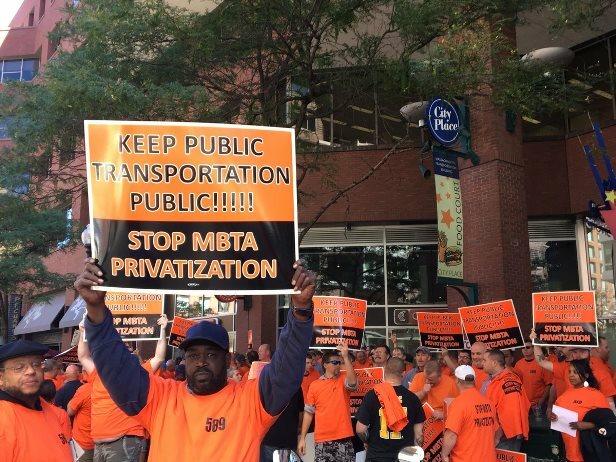 Local 264 members and other unions representing workers at the Massachusetts Bay Area Transportation Authority (MBTA), Boston Carmen’s Union Local 589 and IBEW Local 103, flooded an MBTA board meeting to make their opposition clear. They say the privatization will lead to a decline in service and unfairly punish workers for a lack of investment in the system that spans back decades. “I’m unclear about why the potential privatization of bus maintenance has apparently become front-burner when I think there are many steps down that road that must be taken first,” Local 264 Business Representative Craig Hughes told the board, according to the Boston Globe. IAM members and others held signs proclaiming “Keep Public Transportation Public” and applauded when board members criticized outsourcing.